Many patients of implant dentistry need to undergo bone regeneration in order to increase the success rate of the procedure. The recent advancements in technology have made it possible to regenerate bone tissue by using grafting materials. The procedures are somewhat predictable with minimal risk of complications. Bone regeneration is key for patients who want to use dental implants to replace missing teeth but do not have adequate bone that is required to anchor the implant. One of the main reasons why you need to replace a missing tooth immediately is to prevent loss in bone volume. Bone regeneration can be done using various techniques. Most of the techniques used today involve opening the bone tissue to expose the bone then adding some grafting materials to augment the remaining bone. 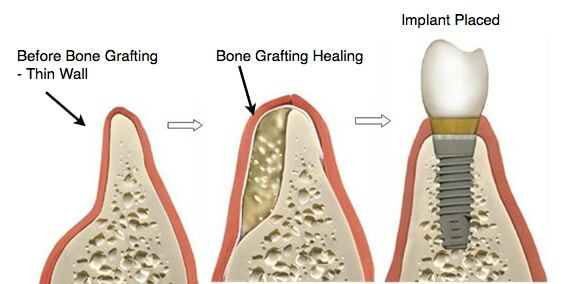 The grafting material needs to heal before the implant procedure is done. There are special membranes that are used to promote and enhance healing of the grafting material and consequently the success of implant procedure. How much bone is needed? During bone regeneration, the dentist first has to determine the amount of bone that is needed to provide adequate support to anchor the implant. If you are having a single tooth implant then the grafting material that will be required for bone regeneration is likely to be minimal. This means that you can take it from a variety of sources. There is the option of getting a living source of bone cells. Most patients prefer this not only because it can help to regenerate bone much faster but also because it gives them peace of mind knowing that the grafting material is part of their body. However, autographs do have their own drawbacks. The major one is that you will end up with a second surgical site. Your dentist may recommend other types of grafting materials. These include the manmade and synthetic xenografts. These grafting materials have undergone processing to ensure they are safe for human use. Your dentist will take you through the options you have when it comes to grafting materials depending on how much bone is actually needed. In time, your body will replace the grafting material with its own bone tissue. The material is only used as a scaffold to help promote bone regeneration. The dentist may also consider having the implant placed with a bone graft at the same time. In this case, the new bone is going to be regenerated simultaneously. The only condition is that, there should be some bone that helps to at least stabilize the implant as you wait for the new bone to be regenerated. Any surgical bone regeneration procedure should be carried out by a dental expert together with a local anesthetist. You will be put on sedation during the procedure and given antibiotics later in order to prevent infection, inflammation and pain on the area. Bone regeneration is a routine procedure that is commonly done in major dental clinics.